This excellent running Lodge is located on one of the most beautiful spots in the mountains of Uvita (only 10 minute’s drive from the centre), the beaches and the Marino Ballena National Park. The Lodge is selected as a member of the Costa Birding Society due to the many birds spotted on the estate. 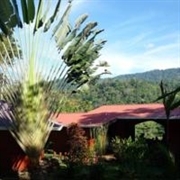 In addition, the lodge is not far away from the national park Corcovado, Manuel Antonio and Chirripo. The Lodge was designed and built in 2009/2010 and is very well maintained. All detached houses (with rooms and studios) have a private entrance and patio and are therefore the ideal place to relax and to observe the many birds. The rooms and studios are designed according to the European concept of quality and therefore very light and comfortable, creating a homely feeling. This is a turnkey successful business and a good investment. 5 bungalows (on 1 hectare of private land) all situated on different levels in the tropical garden. 1 bungalow used as a residence with kitchen, bar, restaurant and swimming pool (with Jacuzzi). 3 bungalows divided into 6 rooms / studios, each with its own private entrance and patio. 1 bungalow in use for guide / driver / staff. The lodge is located in a safe and quiet area with private entrance and private parking places. The restaurant is specially designed and has a beautiful view of the jungle and is ideal for bird watching. Beautiful tropical garden (completely organic) with lots of fruit (trees), plants and flowers. Plenty of possibilities for expansion. Bedroom with private bathroom, living room, kitchen and private terrace. Mountain views. One of the most beautiful spots in the mountains of Uvita. The property is 1 hectare in size and has many potentials for expansion. The lodge is well occupied despite little advertising and has a very good reputation with various travel organizations in Costa Rica and Europe. Great potential for expansion with slightly more marketing. We can offer any support and training necessary to the prospective buyer.